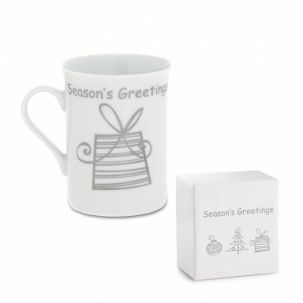 A ceramic coffee in white with the words 'Season's Greeting' in Silver. the mug also features a bauble, a tree and a present in silver. Each mug comes in its own gift box measuring: 10.5 x 10.5 x 8.5 cm. The box has the same festive design as the mug making this a fantastic Christmas Gift / Stocking Filler and Favour.